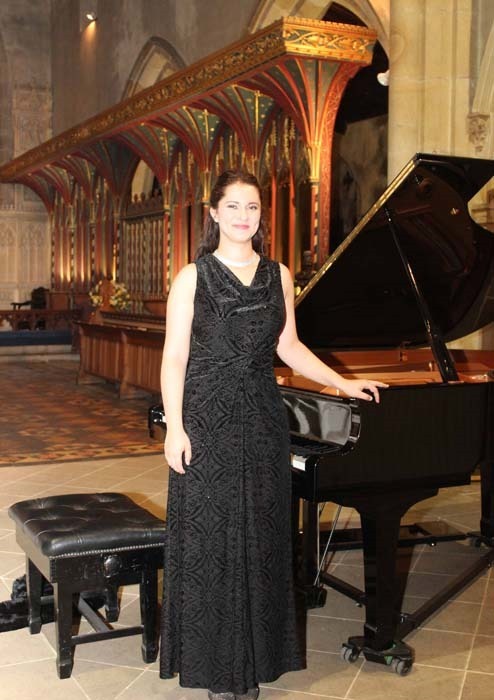 Pianist Yasmin Rowe captivated her audience at St Andrew’s, Aysgarth, on April 21 with a memorable performance for the Wensleydale Concert Series which encompassed music by Bach, Bartok, Beethoven and Schumann. She is well known for her eclectic performances and this was certainly true in the first half with the complete contrast between Bach’s Partita No 2 in C Minor to her commanding and dramatic rendition of Bartok’s Suite for Piano Op.14. One of the most memorable performances of the evening, however, was the second movement of Beethoven’s Sonata No 7, Op. 10. She fluently used the full range of the keyboard to share the phases of melancholic depression offset by those fleeting moments of joyful, tingling highs. She finished with an exuberant and thoroughly enjoyable performance of Schumann’s Humoreske Op. 20. This was an excellent start to this year’s Wensleydale Concert Series (WCS). On May 12 Tanya Anisimova is presenting a solo cello recital at Aysgarth church which will include works by JS Bach, Marais, Kodaly and herself. Carol Haynes of the WCS has arranged Anisimova’s first visit to the UK. Her itinerary includes leading a masterclass in Carperby village institute on Saturday May 12 and a cello workshop on Sunday May 13. Anyone who participates in the masterclass and workshop (costing £65) will receive a free ticket to the concert at Aysgarth church. Anisimova is also giving a solo recital at Ushaw College Chapel in Durham on Saturday May 19, followed on the Sunday by a Schumann Cello Concerto study day with the Cobweb Orchestra at Eldon Community Centre. For more details about her British tour see the Wensleydale Concert Series website. The next three WCS concerts are all at Aysgarth church: the Treitler Quartet with pianist Nico de Villiers on Saturday June 16; a clarinet and piano recital by Peter Cigleris and Martin Cousin on Thursday July 12; and a recital for violin and piano by Martyn Jackson and Petr Limonov on Saturday August 11. There are three more concerts in the series this year two of which being afternoon ones in Carperby village hall: The New World String Trio on Sunday September 9; and an afternoon of baroque instrumental and vocal music with the Eboracum Baroque on Sunday November 4. Two favourites of the WCS series, pianist Daniel Grimwood and violinist Fenella Humphreys, return on Saturday September 29 for a chamber music concert at Aysgarth church. As part of a fundraising idea of the WCS (which is now a registered charity) they have agreed to participate in a concert with two amateurs – Michael Cave, a superbly talented flautist, and Carol Haynes (making her debut as a cellist in a chamber concert). It is now possible to buy a season ticket for this year for £75 which is equivalent to a saving of two concerts on the advance booking price of £12.50 or three concerts at the door price of £15. See www.wensleydaleconcertseries.co.uk for more information.